Success, ambition, and glamour dominate this block of Benefit Street. John Brown became wealthy from his family’s shipping business, which included privateering, the China Trade, and Triangular Trade. John, along with his brothers Nicholas, Joseph, and Moses, financed the voyage of the slave ship Sally in 1764 that proved a disastrous endeavor, both in loss of life (109 of 196 enslaved Africans died before the ship reached Jamaica), and financially (which convinced all the brothers but John to discontinue their involvement in the trade). John Brown had this luxurious home built for his family in 1786. The family had previously lived in a townhouse across the street from his brother’s home at 50 South Main Street, which still stands today. One of the grandest in the United States, the Power Street mansions played host to presidents George Washington, Thomas Jefferson and John Quincy Adams. Washington visited in 1790 on his first tour of Rhode Island since becoming president, as he had avoided it while Rhode Island remained a hold-out on the ratification of the Constitution. The house passed through several Brown descendants until 1901 when it was purchased by Marsden J. Perry, a utilities and transportation magnate. Perry made significant changes to the property in the spirit of colonial revival, filling the house with early American antiques as well as the most complete collection of Shakespeareana in the world. Perry reportedly wanted to acquire a particularly rare folio, and when he lost the bid, he decided to get rid of his whole collection, which became the founding collection of the Folger Shakespeare Library. 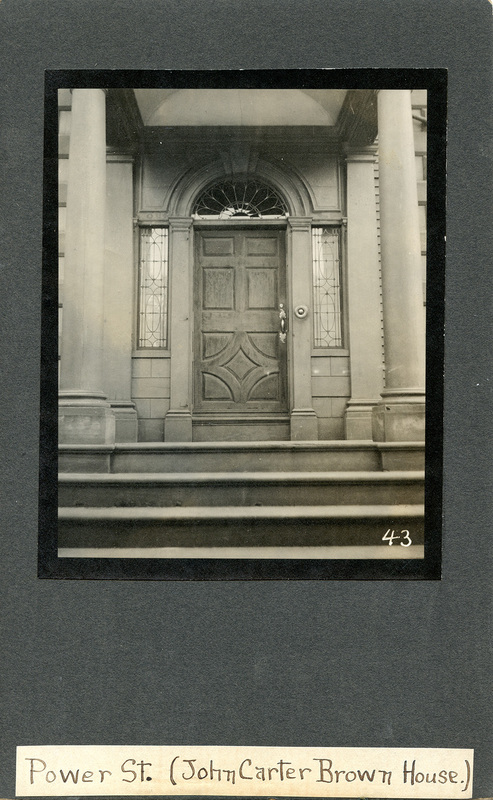 John Brown House 1937: John Nicholas Brown purchased the house in 1936 but never lived in it. He opened it for tours in conjunction with Rhode Island's tercentenary celebrations that year. The cost of admission was $1.00. John Brown House 1920: With the grand scale of the John Brown House, it is easy to lose sight of the details, but they merit consideration. John Brown would have appreciated the attention paid to his home, too: he sent his son and son-in-law to visit mansions all along the eastern seaboard to subtly take measurements and steal ideas to use in his grand home under construction on Power Street. 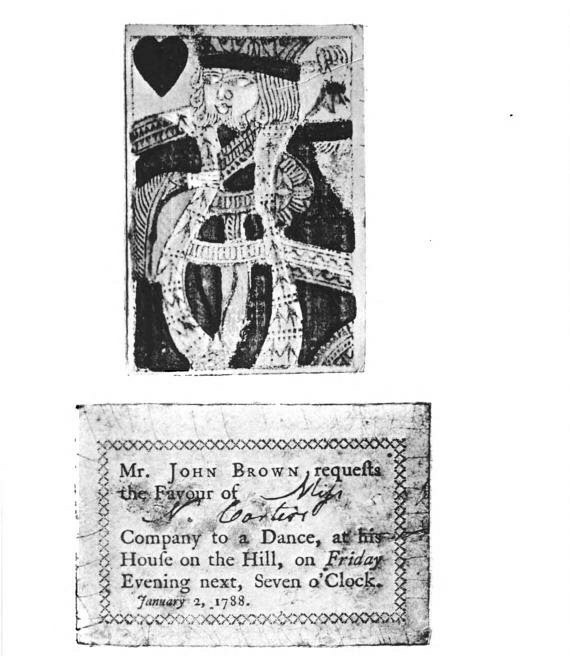 John Brown Playing Card: In Providence in Colonial Times (1912), Gertrude Selwyn Kimball reproduces John Brown's playing card, which served as an invitation to guests to have the first public glimpse of his newly constructed house. It also served as a wedding invitation: John's daughter Abigail married John Francis on January 2, 1788, and guests celebrated on the as-yet-unfurnished second floor, which, without furniture, was an ideal space for dancing. 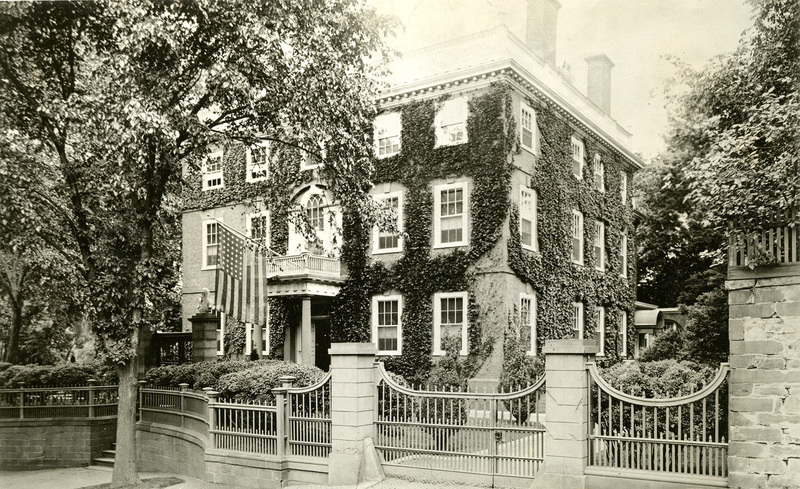 John Nicholas Brown, a great collector and preservationist, bought his great-great-great uncle’s house in 1936, and then donated it in 1942 to the Rhode Island Historical Society, which now operates the house as a museum. When John Nicholas Brown bought the house, Rhode Islanders were in the midst of celebrating the tercentenary of its founding (a stamp was even issued in commemoration). The country itself was awash in colonial revival fervor. Brown, then, was on-trend when he commissioned the installation of hand-painted wallpaper depicting Washington’s inauguration in New York, which is still on view in the museum. Elyssa Tardif, “John Brown House Museum,” Rhode Tour, accessed April 21, 2019, http://rhodetour.org/items/show/192.